Cris Ellis is founder & proprietor of Astronomy Alive, a division of Ellis Marketing (established 1987). His astronomy experience spans decades of continuous innovation & growth and his astronomy knowledge is exceptional – even by global standards. Cris’ strategy in selecting optics with customers is simple – Do it Once – Do it Right – using Exclusively the best products. We only supply quality telescopes that actually perform – we do NOT supply low quality units that disappoint (there are plenty of those I assure you). Did you know that Astronomy Alive is 100% Australian owned, 100% Australian located and 100% Australian operated? 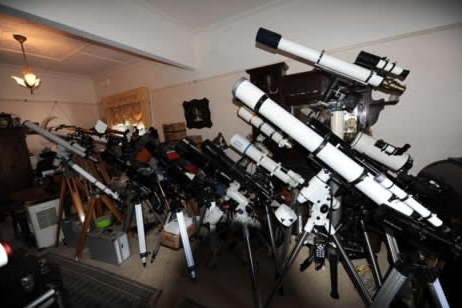 Our telescope showroom and workshop is located in the Melbourne suburb of Bentleigh. We are Melbourne’s ONLY specialist supplier of telescopes. Our competitors are: Camera stores, Department stores or Webpage suppliers only – all with limited / no specialist knowledge in telescopes & astronomy. We recommend you use caution when buying. Australia’s most advertised telescope business in most internet searches – aren’t Australians, aren’t owned or managed in Australia. They may use a very Australian sounding business name, but are a foreign business. When you contact us you are answered by the business owner, Cris Ellis – personally. Cris is a specialist and is at your availability to assist every aspect of astronomy & optics – you are not merely contacting a … salesperson in a shop. Cris is a globally leading specialist telescope designer & optical engineer. He has a long history designing specialist optics for many of the world’s leading telescope manufacturers. We are the most experienced specialist astrophotography products supplier in Australia, and have the most exceptional range of astroimaging equipment available of any supplier globally. Representing in excess of 70% of the world’s highest capability premier manufacturers of specialist astrophotographic equipment – with most of these being exclusive in Australia to Astronomy Alive. Our portfolio of astrophotographic products is specifically custom engineered to provide the maximum performance to the beginner, experienced, professional & institutional astrophotography enthusiast. These products are also available at prices that will surprise – as we deal direct with the world’s premier optics manufacturers – and thereby achieve sourcing of the highest quality astrophotography products at prices which are well below the cost of other Australian suppliers – who simply do not know who these suppliers are / or cannot access these sensational suppliers as Astronomy Alive has exclusivity for their products. Jupiter at 8 years old ……. Cris Ellis was introduced to astronomy at age 8, when he viewed Jupiter through a telescope. He saw the round disc of the planet and its four major moons, and was instantly hooked on astronomy. Cris is well known in Australian astronomy as founder and president of the Astronomical Society of Melbourne. 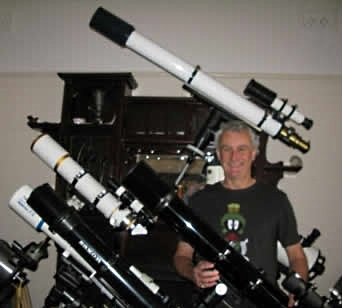 He is also creator and teacher of astronomy courses at various Melbourne colleges. He is an established astronomy author in Astrophysics & Cosmology, the most active night sky tour leader and astronomy public speaker in Australia, and has assisted with the establishment of astronomical societies in Asia. He comes from a long history in specialist physics & engineering in the global automotive industry. Cris is the only specialist technical designer, hand craftsman & specialist optical consultant in Australia. He designs specialist optics for many of the world’s premier telescope manufacturers. His linkages with the optics industry globally are unique. These linkages enable him to source optics directly from the world’s premier optics manufacturers in Japan, Germany & Russia – and bespoke manufacture these premier optics into a telescope portfolio with much more attractive pricing. These optics also being available under popular global leading brand names (but not at our low prices). Astronomy Alive has significantly the most comprehensive portfolio of astronomy and astrophotography products in the southern hemisphere, from beginner through intermediate, plus advanced, professional and also right up to full major observatory systems. Cris is the preferred supplier of beginner telescopes for newbies to astronomy – right through to designing and supply of major observatory systems to professional, university, institutional, scientific & research bodies throughout Australasia, South East Asia, North America & Europe. He is Australia’s most experienced astronomy specialist tour designer & guide, customising specialist tours to the world’s major observatories. Astronomy Alive is proud to support nearly every major premier manufacturer of quality telescopes and astrophotography systems globally. With many of these global astronomy paragons of capability & quality having their exceptional products being exclusively available from Astronomy Alive. Our product range is without rival by any local/ national/ regional supplier. If you do not find a particular product that you are interested in on our webpage – there is a good reason for this – as Cris isn’t interested in that supplier or their products – as we refuse to supply products that we regard as lower in quality / capability than the minimum standard – or are excessively expensive as they are going through too many sets of hands to get to you the customer (which is avoidable, call us to understand more). We prefer to deal direct with the manufacturers of the world’s best telescopes, not the marketers – “Branders” – who do not manufacture anything. In short – you the customer deserve better gear that actually performs !